Polamar Skies - Press Release: Caltech-led Astronomers Find a New Class of Stellar Explosions | Astro What? Below is a press release that was issued today about some of the science behind the Palomar Transient Factory survey. PASADENA, Calif.—They're bright and blue—and a bit strange. They're a new type of stellar explosion that was recently discovered by a team of astronomers led by the California Institute of Technology (Caltech). Among the most luminous in the cosmos, these new kinds of supernovae could help researchers better understand star formation, distant galaxies, and what the early universe might have been like. "We're learning about a whole new class of supernovae that wasn't known before," says Robert Quimby, a Caltech postdoctoral scholar and the lead author on a paper to be published in the June 9 issue of the journal Nature. In addition to finding four explosions of this type, the team also discovered that two previously known supernovae, whose identities had baffled astronomers, also belonged to this new class. Quimby first made headlines in 2007 when—as a graduate student at the University of Texas, Austin—he discovered what was then the brightest supernova ever found: 100 billion times brighter than the sun and 10 times brighter than most other supernovae. Dubbed 2005ap, it was also a little odd. For one thing, its spectrum—the chemical fingerprint that tells astronomers what the supernova is made of, how far away it is, and what happened when it blew up—was unlike any seen before. It also showed no signs of hydrogen, which is commonly found in most supernovae. At around the same time, astronomers using the Hubble Space Telescope discovered a mysterious supernova called SCP 06F6. This supernova also had an odd spectrum, though there was nothing that indicated this cosmic blast was similar to 2005ap. The 1.2-meter Samuel Oschin Telescope at Palomar Observatory that was used to discover four supernovae of a new class. Inset: one of the newly discovered supernovae, PTF09cnd. Shri Kulkarni, Caltech's John D. and Catherine T. MacArthur Professor of Astronomy and Planetary Science and a coauthor on the paper, recruited Quimby to become a founding member of the Palomar Transient Factory (PTF). The PTF is a project that scans the skies for flashes of light that weren't there before—flashes that signal objects called transients, many of which are supernovae. 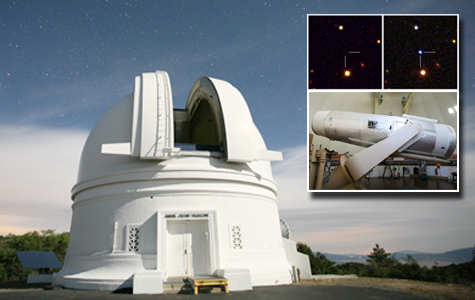 As part of the PTF, Quimby and his colleagues used the 1.2-meter Samuel Oschin Telescope at Palomar Observatory to discover four new supernovae. After taking spectra with the 10-meter Keck telescopes in Hawaii, the 5.1-meter telescope at Palomar, and the 4.2-meter William Herschel Telescope in the Canary Islands, the astronomers discovered that all four objects had an unusual spectral signature. Quimby then realized that if you slightly shifted the spectrum of 2005ap—the supernova he had found a couple of years earlier—it looked a lot like these four new objects. The team then plotted all the spectra together. "Boom—it was a perfect match," he recalls. The astronomers soon determined that shifting the spectrum of SCP 06F6 similarly aligned it with the others. In the end, it turned out that all six supernovae are siblings, and that they all have spectra that are very blue—with the brightest wavelengths shining in the ultraviolet. According to Quimby, the two mysterious supernovae—2005ap and SCP 06F6—had looked different from one another because 2005ap was 3 billion light-years away while SCP 06F6 was 8 billion light-years away. More distant supernovae have a stronger cosmological redshift, a phenomenon in which the expanding universe stretches the wavelength of the emitted light, shifting supernovae spectra toward the red end. 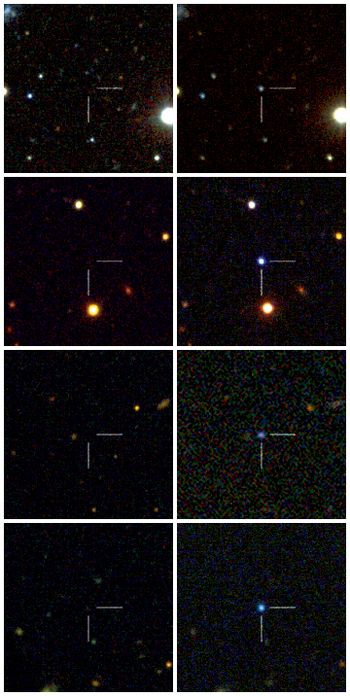 The four new discoveries, which had features similar to 2005ap and SCP 06F6, were at an intermediate distance, providing the missing link that connected the two previously unexplained supernovae. "That's what was most striking about this—that this was all one unified class," says Mansi Kasliwal, a Caltech graduate student and coauthor on the Nature paper. Even though astronomers now know these supernovae are related, no one knows much else. "We have a whole new class of objects that can't be explained by any of the models we've seen before," Quimby says. What we do know about them is that they are bright and hot—10,000 to 20,000 degrees Kelvin; that they are expanding rapidly at 10,000 kilometers per second; that they lack hydrogen; and that they take about 50 days to fade away—much longer than most supernovae, whose luminosity is often powered by radioactive decay. So there must be some other mechanism that's making them so bright. One possible model that would create an explosion with these properties involves a pulsating star about 90 to 130 times the mass of the sun. The pulsations blow off hydrogen-free shells, and when the star exhausts its fuel and explodes as a supernova, the blast heats up those shells to the observed temperatures and luminosities. A second model requires a star that explodes as a supernova but leaves behind what's called a magnetar, a rapidly spinning dense object with a strong magnetic field. The rotating magnetic field slows the magnetar down as it interacts with the sea of charged particles that fills space, releasing energy. The energy heats the material that was previously blown off during the supernova explosion and can naturally explain the brightness of these events. The newly discovered supernovae live in dim, small collections of a few billion stars called dwarf galaxies. (Our own Milky Way has 200–400 billion stars.) The supernovae, which are almost a hundred times brighter than their host galaxies, illuminate their environments like distant street lamps lighting up dark roads. They work as a kind of backlight, enabling astronomers to measure the spectrum of the interstellar gas that fills the dwarf galaxies in which the supernovae reside, and revealing each galaxy's composition. Once an observed supernova fades a couple of months later, astronomers can directly study the dwarf galaxy—which would have remained undetected if it weren't for the supernova. These supernovae could also reveal what ancient stars might have been like, since they most likely originate from stars around a hundred times more massive than the sun—stars that would have been very similar to the first stars in the universe. In addition to Quimby, Kasliwal, and Kulkarni, 24 other authors—11 of whom are from Caltech—contributed to the work described in the Nature paper, "A new class of hydrogen-poor super-luminous stellar explosions." This research was supported by the National Science Foundation, the United States-Israel Binational Science Foundations, the Israeli Science Foundation, the Department of Energy, the Gordon & Betty Moore foundation, Gary and Cynthia Bengier, the Richard and Rhoda Goldman Fund, and the Royal Society. The Palomar Transient Factory is a collaboration between Caltech, Columbia University, Las Cumbres Observatory Global Telescope, Lawrence Berkeley Laboratory, UC Berkeley, University of Oxford, and the Weizmann Institute of Science (Israel).